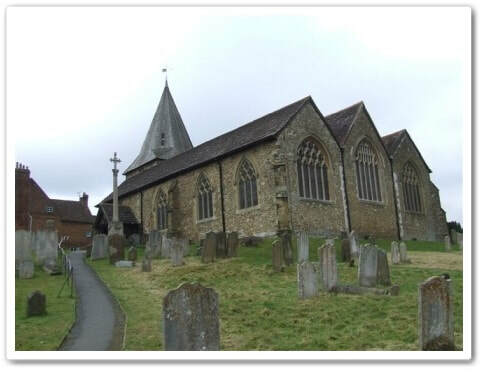 On Friday afternoon, by the kind permission of the Vicar of Westerham and the Military Authorities, a military funeral of a gallant Australian took place here. The young man had been all through the war, having taken part in the Dardenelles and Gallipoli campaigns, and having been wounded in France, was sent to Dunsdale Hospital, Westerham, in 1916. He made many friends, and was popular with all parties. Returning to France, he took part in most of the serious fighting that took place. Last September he was resting in a dugout when a shell burst, wounding him in the temple. He was removed to England, and was in hospital at Bronsbury, where he passed away on March 2nd. The body was brought to Westerham (where he had spent some happy times) on Thursday, and was placed in the Church for the night. On Friday a firing party and bearers of the Australian Forces came down by rail, under the charge of Warrant Officer Walter J. M. Sedgley, West Australian Headquarters, London, and the splendid way in which they carried out their painful duties was very marked. The service was conducted by Senior Chaplain the Rev. W. Floyd Shampson, and was attended by many of the nurses who served at Westerham, and Mr. and Mrs. Buck, besides many of the inhabitants of Westerham. The coffin was covered with the Union Jack, and many beautiful wreaths were also sent. 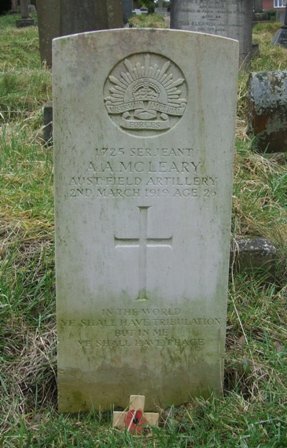 The breast-plate stated: "Alexander Allen McLeary, 31st Brigade, A.F.A., died March 2nd, 1919, aged 26." After the service the usual three rounds were fired and the "Last Post" sounded, Mr. Benson, of Keswick Studely, took photos of the grave. We hear that he had lost a brother in France, and another has been wounded. — Australian papers, please copy.